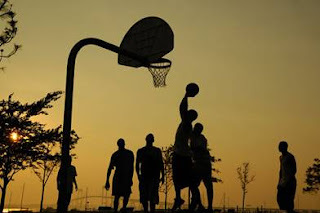 You went out to the local court over the weekend and played a few of your best pickup games ever. Now it is Monday, and your shins are stiff and painful, your back is aching, and your knees are starting to swell. If this scenario sounds familiar, then you have experienced what I call an “under fit” injury. I do not like to call them overuse injuries because that implies you should not use the muscles. “Under-fit” means you were not prepared for whatever activity you engaged in. You played three games of basketball instead of one. Basketball is an excellent sport for overall conditioning. It offers intense aerobic workout while strengthening muscles throughout the body. But it can also cause finger and ankle injuries, sprains, tendinitis, back spasms, and knee problems. Here are some tips on how to get the gain without the pain. • Warm up. Begin with low-intensity aerobic activity before getting into the heat of the game. Stretching, however, is only recommended after playing. Stretching beforehand can actually make muscles weaker by fatiguing them. • Use the right gear. Make sure shoes fit properly and offer the right support. If you have had wrist, knee, or ankle injuries before, it might be helpful to wear a brace. If you do feel you have overdone it, remember the acronym RICE — rest, ice, compression, and elevation. If pain persists, increases significantly with activity, or causes swelling, limping, or limited range of motion, see a physician immediately. Many patients come to the doctor with aches and pains that “started out of nowhere” apparently without an injury. They have experienced a stress to their system that was above some undefined threshold and resulted in an injury. Everyone has heard the term overuse. I don’t like it because it implies that there is something wrong with using our bodies. Our bodies are built to be used. I prefer to think more in terms of underfitness, meaning that the activity performed was above the fitness threshold resulting in damage to some part of the musculoskeletal system. In every case there are two options. One option would be to stop or limit the activity performed. This is not only no fun it’s unhealthy. The second option is raise the fitness threshold such that it is never surpassed and no injuries are incurred. This would be great except that it is unlikely that anyone can obtain and more importantly maintain their perfect maximum fitness level. Therefore it is inevitable that we all will have some aches even if we have a high fitness threshold. These aches should be very mild, short lived and self limited. In fact most will resolve if the body is allowed to repair itself. Daily or at the very least weekly physical activities to “stress” your system will strengthen it. As the fitness level increases so will the amount of activity required to cause pain. The inertia of being out of shape makes it extremely difficult to make any significant commitment to exercise. By exceeding our threshold in our first few workouts we become sore or even painful where we can no longer perform. This stops us in our tracks physically not to mention what it does to our mental outlook. The next re-initiation of a workout program is more difficult and less likely to succeed. A more gradual approach is much more effective. 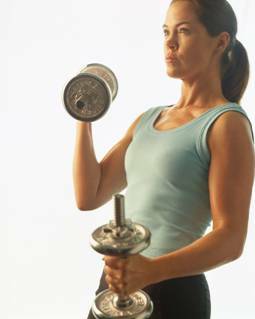 This allows the body to repair the “damage” from a work out and stepwise progress toward healthy fitness is made. If significant soreness is present don’t stop workouts just decrease intensity and persists at a lower level. Then make slower progress as the discomfort subsides. If problems persist seek professional help.